Cooking without the right utensils takes a lot more effort, which is the last thing you need during Whole30. 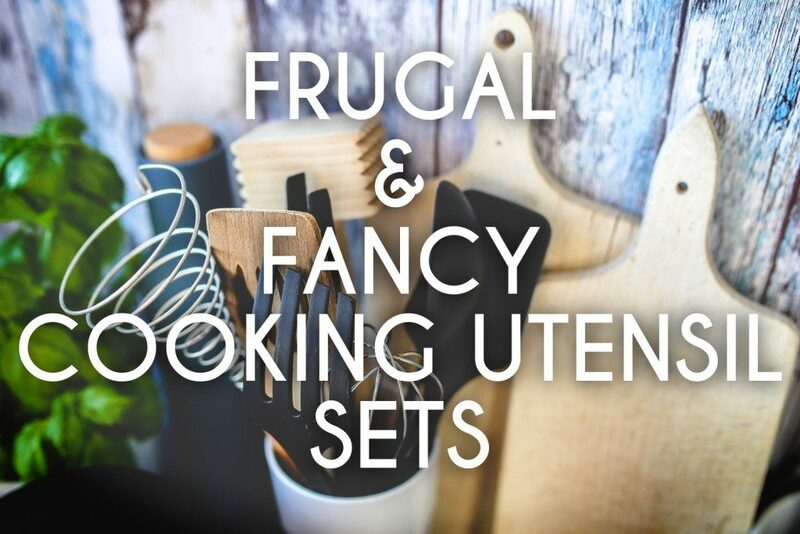 Whether you’re new to cooking or are simply looking to update your kitchen wares, here are a few frugal and not-so-frugal cooking utensil options to fit any budget. We absolutely love this basic starter set, which includes a ladle, slotted spatula, slotted spoon, serving spoon and skimmer. The sturdy, stainless steel construction stands up to a lot of use, and all the pieces are dishwasher safe. Plus, it’s only $10! While this set isn’t break-the-bank expensive, it’s still a little pricier than the Amco option. It too contains a slotted spatula, serving spoon, slotted spoon and skimmer, as well as a serving fork and a spaghetti server (which I lovingly refer to as the “pasta claw”). At $30, it’s still affordable and the all-steel construction will last a lifetime. This is a great value for most Whole30 kitchens, especially if you use non-stick cookware. It contains pretty much everything you need, from a slotted spoon and spatula to a zester, whisk, tongs and can opener. Every item is dishwasher safe except for the can opener, and all are heat resistant up to 450 degrees Fahrenheit. The kit costs just under $40, and is made from durable plastic and stainless steel. Set Contains: Slotted spoon, serving spoon, whisk, tongs, can opener, zester, peeler, measuring cups (four pieces), measuring spoons (five pieces), spatula. I won’t beat around the bush: this kit costs $100. However, most users describe it as an investment. The nylon, stainless steel and silicone construction is sturdy and safe for non-stick surfaces. It is also heat resistant up to 400 degrees Fahrenheit, like its frugal counterpart. This kit contains two fewer components than the KitchenAid set, but the tools are also different. Set Contains: Nylon flexible spatula, 12” tongs, nylon square spatula, nylon spoon and slotted spoon, grater, peeler, ice cream scoop, potato masher, can opened, whisk, silicone spatula, meat tenderizer and pizza cutter.